This paper presents a tutorial on digital design derivation using DRS. The DRS system is an integrated formal system for the design of verified hardware. 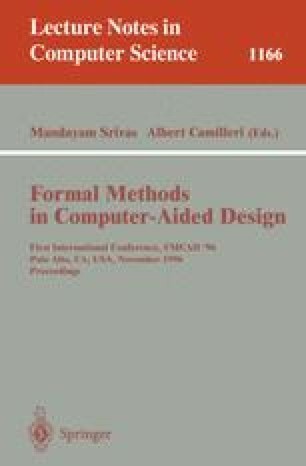 The underlying approach employs a derivation methodology in which a series of correctness preserving transformations are applied to high-level specifications in order to synthesize hardware descriptions. In this paper, we sketch the key steps in the derivation of an example circuit. The example illustrates several aspects of DRS and serves as an introduction to the derivational paradigm of synthesis. Research reported herein was supported, in part, by The National Aeronautics and Space Administration.